They just don’t make Christmas lights like they used to. Everything from the attention to detail, to the hand-crafted look, to the interesting sizes and shapes of older lights make a lot of what’s on the market today seem like it was cut from the same stencil. But much like vinyl records in today’s music scene, vintage Christmas lights are making a big comeback thanks to people who want to preserve the memories of a bygone era while adding a hip sense of throwback to their otherwise modern surroundings. Bubble Candle Lights are big, bright and fun to be around. 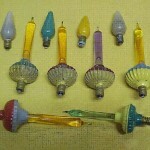 Ideal tree lights, bubble candlelights have been a popular model for several decades. All you have to do is place them, plug them in, and in an instant your home is transformed into a place of warmth and holiday delight. Star Lights are a timeless classic in the world of holiday décor. 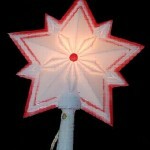 The shape and luster of these particular lights exude a magic to which there is no comparison. Available in an array of styles, sizes and colors, star lights have the advantage of remaining timeless yet staying consistently fresh and exciting. Sugared Round Christmas lights produce a wondrous glow that will make the perfect addition to any holiday celebration. 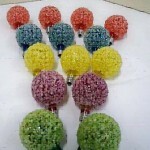 These big beautiful orbs will bathe any area of the house in soft yet colorful light. Available in many sizes and colors; sugared rounds are sure to get your house some attention from neighbors and friends. Christmas lights look good on patios, around roofs and on wreaths of all kinds. When combined with your existing décor, vintage Christmas lights add a unique element to any design or decorating scheme. Their antiquated look, combined with the nostalgia they induce, make vintage Christmas lights the perfect personal touch to any home or office. No matter what look you’re going for in your holiday decorating, you can be guaranteed to find a vintage light or ornament that will compliment your idea perfectly.